Normal pubic hair consists of 1- hair FU. In the past, transplantation of 2-hair, 3-hair FU was considered to bring unnatural results and transplants were separated into 1- hair FU. However, this resulted in sparse appearance of the transplanted hair. Recently, 2-hair FU is used in the middle and 1-hair FU is used in the edges, which brings naturally thick appearance. The epidermis and dermis are very thin in the pubic area whereas the epidermis and dermis around scalp hair follicles are much thicker. Therefore, transplantation of scalp hair follicles onto the pubic area, often resulted in deeper than normal placement of follicles in the recipient site. 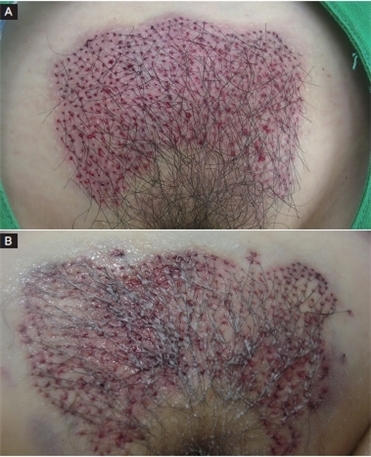 This posed a high risk of folliculitis, requiring thorough de-epithelization of transplanted follicles. In addition, the subcutaneous fat of the pubic skin is very thick and transplanted hair follicles often failed to adhere in the thin pubic dermis and slipped into the subcutaneous fat. This was closely related to the patient’s skin elasticity. If the transplanted follicles kept falling into the subcutaneous fat due to reduced elasticity of the skin, graft survival was severely compromised and the risk of folliculitis, epidermal cyst, etc. increased (Figure 1). Moreover, the patient’s activity after the procedure such as walking and bathroom use, etc. may exacerbate derailment of transplanted hair. 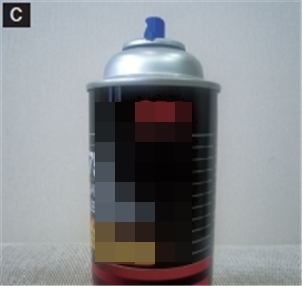 In order to prevent movement of transplanted hair, I used a spray adhesive (3M) on the transplant sites (Figure 2). This was effective in many patients for fixing the transplanted hair by creating an adhesive force between the hairs. Applying a spray adhesive on the transplant sites one to two hours after the procedure when adequate amount of blood clots form is safe without the risk of contact dermatitis.